Sorry, but the above synopsis includes several spoilers. 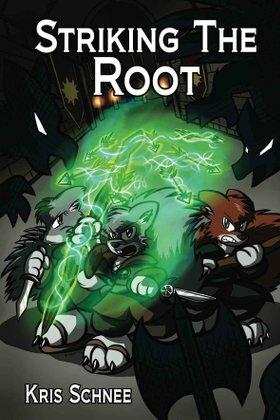 Striking the Root is a semi-mystery that very slowly reveals the details of both the human and squirrelfolk civilizations, and more importantly, the conflicts between them. It is both an adventure about Rowan’s and his companions’ getting involved in that conflict, and a coming-of-age story for Rowan, who learns that the world is a more complex place, and the squirrelfolk are not as united, as he had thought. Tail Town made Rowan feel small. Already there were as many humans around as he’d ever seen at once: guards with spears, farmers here for market day. He made for a row of trees that shaded one street, set down his heavy pack, and climbed up to have a proper look around. Nearby there was a wooden balcony built onto a stucco building. A few of his kind relaxed there at cafe tables. ‘It’s not polite to stare,’ said the man holding her hand. He stomped the little patch of flame with his sandals. He kicked dirt at it and shouted for help. The front wagon was on fire too! He spotted a shadow moving near the rear wagon to his left, lighting a third fire near where the others were sleeping. Rowan yelped and skittered away from the frightening fire and intruder. He heard the horses waking too. ‘What is it?’ shouted one of the wagon drivers. But, faced with at least a half-dozen different factions, which of them is “right”? I like Virmir’s cartoony but expressive artwork on the Metamor Keep website, but his cover does not do Striking the Root justice. It is so cartoony that it is misleading as the cover of a serious adventure fantasy. It is also confusing, showing three furry anthro animals snarling and holding weapons. They are so generically furry animals that they could be anything from wolves to dogs; you have to read the story to find out they are squirrels. You also cannot tell if they are protagonists defending themselves, or villains threatening the protagonists. I like covers that show specific scenes (page 168) rather than abstract art, but they should not be this vague. Kris Schnee has long been one of the lesser-known yet more highly capable authors of the fandom, and I'm pleased to see that this is finally changing.